The abbot of the Monastery of Saint Theodosios in Jerusalem, Elder Hierotheos, describes in the video below what the Orthodox monks of the Holy Land are made to endure at the hands of Palestinian Muslim extremists. The story of Elder Hierotheos is one of the many stories of the monks of the Holy Land, who are daily tormented and endure hardships. 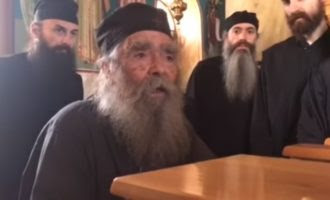 Elder Hierotheos has been in the Holy Land for 60 years, and as abbot of the Monastery of Saint Theodosios for 40 years he has suffered many hardships, has been attacked by extremists, has been beaten up, has been expelled, and has been threatened. Although he is simple and humble, with steadfastness and deep faith he has endured the suffering. Before the Holy Land he served as a reservist in Korea and in Vietnam. He then became a monk and was ordained a priest, and served as an abbot on Mount Tabor at the Monastery of the Transfiguration, at the Monastery of the Honorable Forerunner at the Jordan, and the Monastery of Saint Gerasimos at the Jordan during the Six Day War. He also served as abbot of the Monastery of the Holy Cross in Jerusalem, as well as other holy sites of the Holy Land. "From the punches I have received, I am completely deaf in one ear, and from the other I can hear a little bit... After I was slapped by a former mayor of the village I had problems with my right eye. With his nail he tore open my cheek and a mole I had on my face... Another time they broke my hand and it was in a cast for a long time... Another time they broke my leg... Once they wanted to burn me alive with my nuns, while another time they opened a tomb on the estate of the monastery outside and they wanted to bury me alive. If the nuns were not screaming along with other women who were passing by they would have done it... Stoning has becoming customary for us. They constantly stone us, let alone spitting on us and publicly shaming us...these things have become like a good morning to us. Glory to God!"